Join the Move the Earth bus trip to the Christians United for Israel Washington DC Summit, July 7-9. The bus leaves from Toms River, NJ at 3pm on Sunday, July 7 and returns on Tuesday night, July 9. 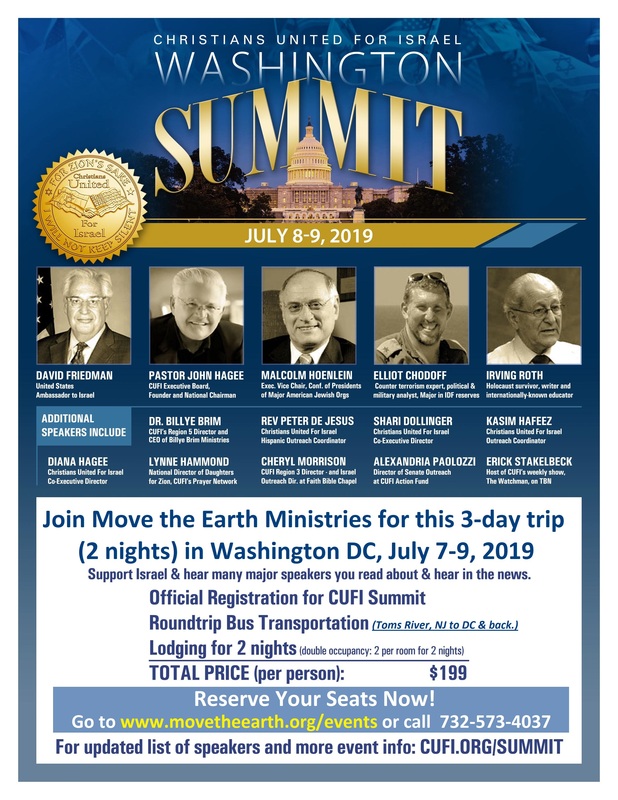 Your ticket price includes round trip transportation on a private coach bus, two nights hotel (double occupancy), registration for the CUFI Summit, reserved seating at the annual National Night to Honor Israel featuring Pastor John Hagee and US Ambassador to Israel David Friedman, and breakfast each morning and lunch on Monday afternoon. Please contact [email protected] for more information or questions regarding the bus trip. For general information about the Summit and the lineup of speakers, please visit the CUFI Summit website.